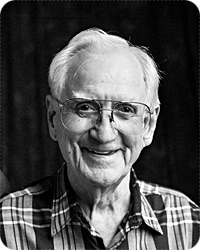 Joe E. Motley, aged 93, of Grand Rapids, went to be with his Lord on Saturday, November 10, 2018. Born in Hubbard City, Texas, Joe moved from Dallas to Toledo to Grand Rapids. He worked in management and distribution for the Keebler Company for 37 years. He was preceded in death by his wife, Norma. Joe will be lovingly remembered by his children, Rebecca (Steven) Lehr, Tim (Patty Caterino) Motley; two grand-children; nine great grandchildren; two brothers and one sister. Relatives and friends are invited to greet Joe's family on Wednesday, November 14, from 5 - 8 pm at Stroo Funeral Home. A private family funeral service will be held. Entombment will be in Chapel Hill Memorial Gardens. Memorial contributions may be made to Rest Haven Home for the Aged.